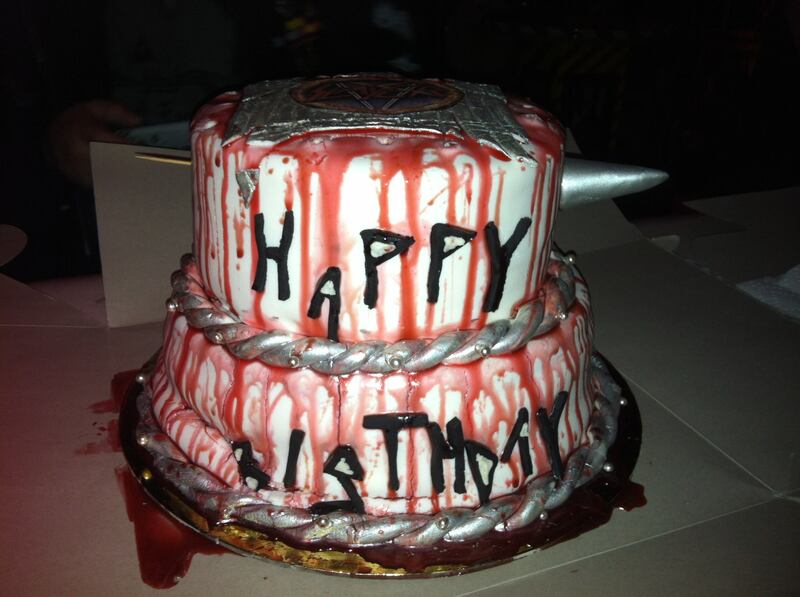 Images seen here of this one-of-a-kind Slayer Birthday Cake were posted on the Facebook page of my friend, Rob. 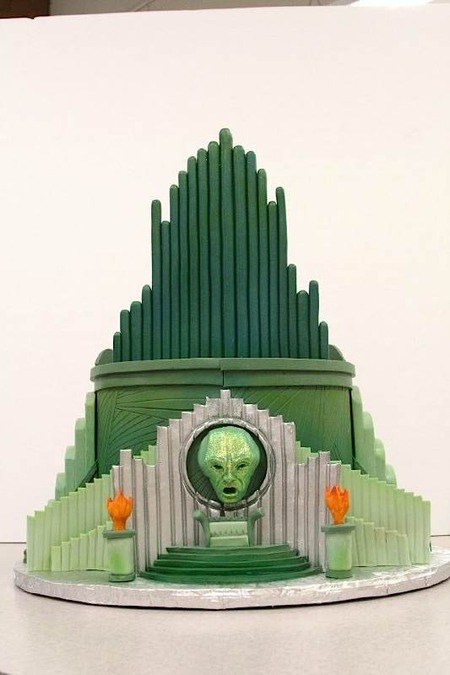 This cake was designed by Jessa Blavatsky, a lady who obviously knows her Metal. 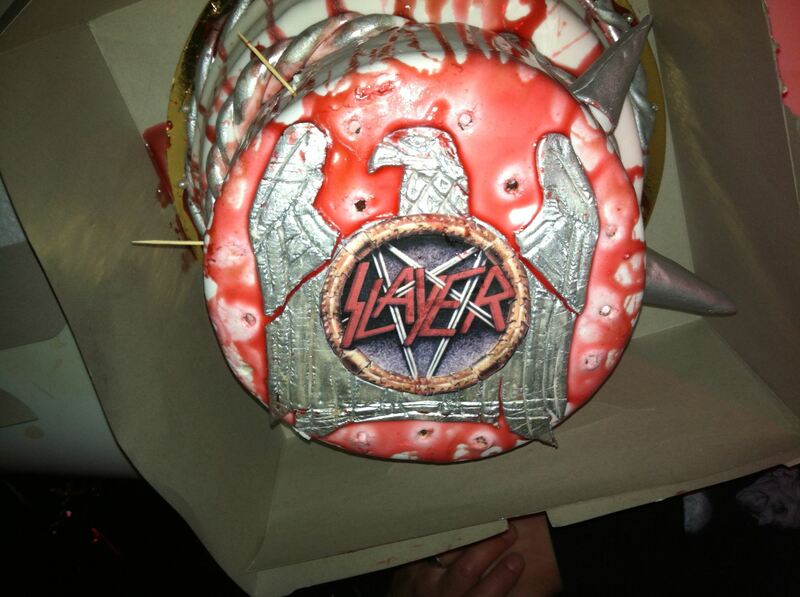 Awesome Slayer Cake celebrates the birthday of Jimmy Duff, owner of the Heavy Metal bar Duff’s in Williamsburg, Brooklyn. Cllearly, what we have here is a case of Too Much Metal for One Cake! Hello, Hurray! 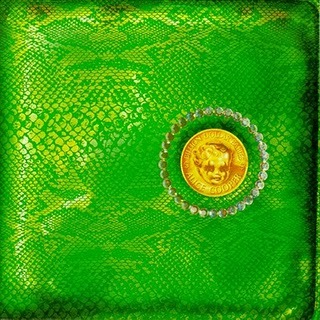 Can you believe I found this by accident? 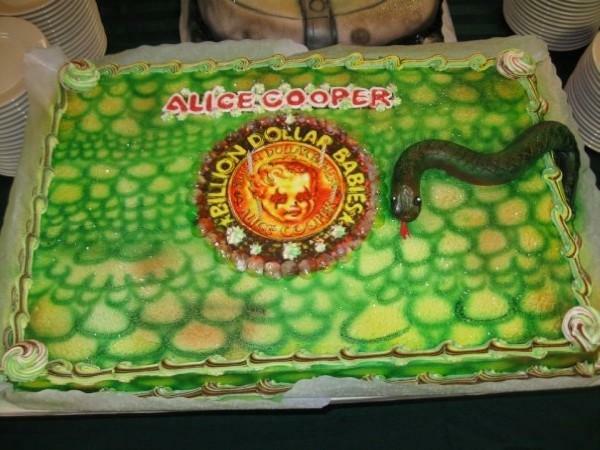 I’m only posting, of course, because this cake, adorned with a representation of the cover of the 1973 album, Billion Dollar Babies, represents the original band called Alice Cooper, and not just Alice. 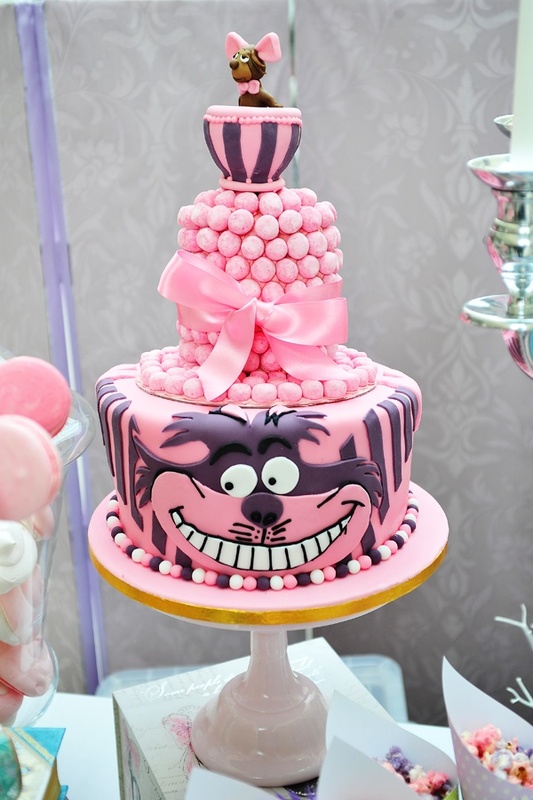 I Love this Cake! When you’ve watched as many cake baking competition shows as I have, you know how hard it is to deliberately make a cake that looks like it’s falling apart, but really isn’t. Check out a screen grab from the original Disney film Sleeping Beauty and you can see that whoever made this cake did a pretty amazing job! Just look at those candles! 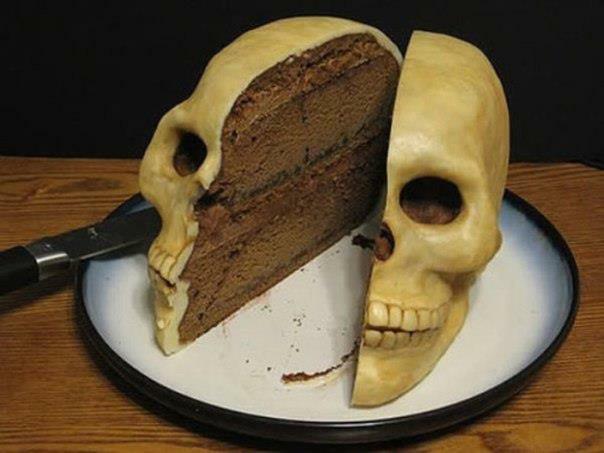 Behold, this realistic and, no doubt, delicious Skull Cake! Image stolen from Ava Rave’s FaceBook Page! Thanks Ava! This Birthday cake in the shape and likeness of rapper Lil Wayne’s head was created for the 14th birthday of Ireland Baldwin (daughter of Alec Baldwin and Kim Basinger), back in October of 2009. I just found it today after Googling “Rock Star Cakes” hoping to uncover something as cool as this. I’m not a fan of Lil Wayne’s “music” or anything, but I do think this cake looks amazing. 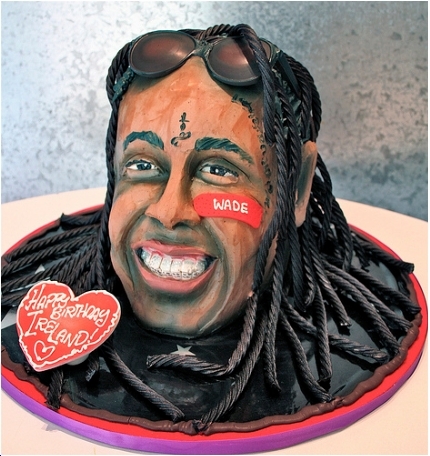 Lil Wayne’s dreads are cleverly fashioned from licorice and his sunglasses are made from modeling chocolate, but based on what is obviously the photo on which the cake was designed (below) I think they could have put more bling in his grill. I’m not sure why there is a name tag (Bandaid?) 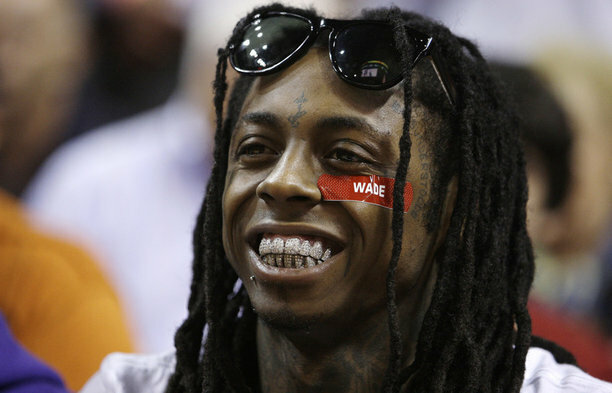 on his face that says “Wade.” Maybe someone can explain that to me in the comments. 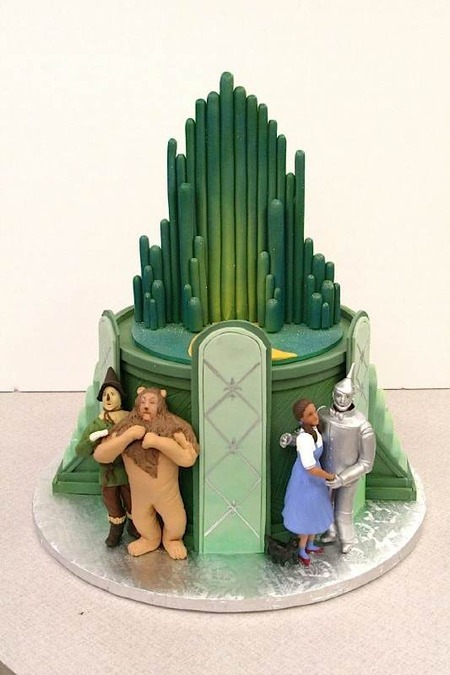 I’d like to credit the bakery of origin, but I couldn’t find the name anywhere online, though I did learn that they are located in Beverly Hills, which makes sense.